Skip Hop Zoo Chopsticks teach toddlers to use chopsticks with a 2-stage design. A silicone topper keeps sticks together for early learning. As your toddler gets more skilled, the top serves as a chopstick rest. A no-slip grip keeps feeding frustration free. They are really cute and my 3.5 year old loves them. However... the bee spring is really wiggly when you use the chopsticks and the sticks twist easily and are very difficult to use. Our baby loves these. He always wants to use chopsticks when the adults are using chopsticks and this helps with the learning process (as opposed to just sticking a chop stick in the food). 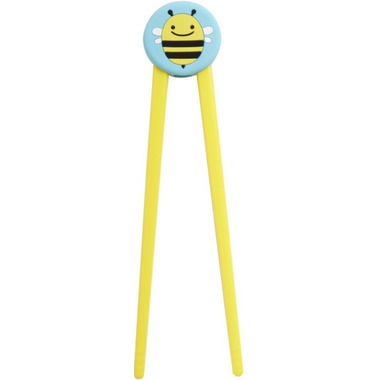 I agree with the previous comment that the chopsticks that come with the set are slippery, but you can put any chopstick in the bee "spring". So you can use just about any chopstick with the spring. My toddler loves playing with these and trying to eat with them, but the sticks are so slippery that they make it very difficult for her to actually get anything into her mouth. I myself find them more difficult to use than my adult chop sticks. These are fantastic chopsticks for kids! Easy to use and clean. They have been a hit with my nieces and nephews!